Welcome to this edition of Europe’s Digital Agenda. 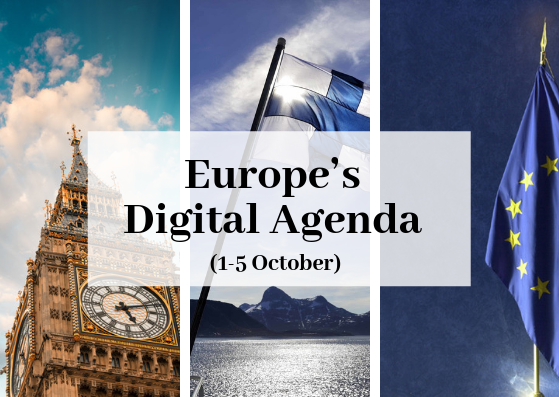 In this space I uncover and detail last week’s digital developments from across Europe, highlighting the most relevant news as well as EU institutions’ forthcoming activities. Today I’m reporting from Helsinki, Finlandalnd where I am attending a Ministerial Conference on Artificial Intelligence (AI) organised by the Finnish ministry of Economic Affairs. The conference brings together European ministers, business leaders and AI experts to discuss the future of AI in Europe. Last week, we had a busy week that included developments around the cross-border digital identification for EU countries and the potential consequences of the recent Facebook’s data breach. This week, we will talk about new rules for facilitating free flow of non-personal data and the EU investing £48m to establish the infrastructure needed for the deployment of broadband in remote areas of Sicily. We will also discuss Brexit and the launch of new regulation for a single digital gateway across Europe. Finally, we will present a look at ‘The Week Ahead’ where we will help you decode the future by outlining the next week’s most relevant digital meetings and events. This week kicked off with the 6th edition of the European Cybersecurity Month with over 300 events scheduled across Europe. The aim of this initiative is to raise awareness of cyber threats, and to promote cybersecurity and cyber hygiene among European citizens and organisations through education and sharing of good practices. The campaign is organised by the European Union Agency for Network and Information Security (ENISA), the European Commission and about 300 partners, including governments, local authorities, universities, think tanks, NGOs and associations. The project, which is expected to be completed by 2020, aims to achieve extensive broadband coverage of the region (> 30 Mbit/s). Over the period 2014-2020, almost £1.75bn (€2bn) of European funds have been invested in digital infrastructure and services in Italy. The European Parliament and Council have today formally adopted the underlying regulation that will establish this single digital gateway. The single gateway will allow European citizens and businesses to find all information, administrative procedures and assistance services linked to their Single Market rights on one single online portal: ‘Your Europe’. As of 2020, European citizens and businesses will be able to use the Your Europe portal, to find all information they need on EU or national rules related to work, education, healthcare, business establishment, taxes or employment of staff. The regulation aims to ensure that in five years’ time more than 20 of the most important procedures can be handled fully online, such as requests for a birth certificate, car registrations, income tax declarations or university enrollments. The European Parliament adopted a regulation on the free flow of non-personal data to achieve a more integrated EU market for data storage and/or processing services and activities. The aim is to reduce the number and range of data localisation restrictions and facilitate cross-border availability of data for regulatory control purposes. The regulation is also set to improve the conditions under which users can switch data storage and/or processing service providers or port their data back to their own IT systems, as well as enhance security of cross-border data storage and/or processing. “This Regulation does for non-personal data what the General Data Protection Regulation has already done for personal data: free and safe movement across the European Union. With its vote, the European Parliament has sent a clear signal to all businesses of Europe: it makes no difference where in the EU you store and process your data – data localisation requirements within the Member States are a thing of the past”, they added. Finland and Estonia will start exchanging digital prescriptions at the end of the year. The Estonian Health Minister Riina Sikkut confine the roadmap and said she hoped other EU countries will follow the initiative. She said that she expects, by the end of this year, the first cross-border digital prescriptions will to be exchanged between the two Baltic countries. Malta, the Czech Republic, Luxembourg are planning to start exchanging patients’ summaries in Europe by the end of 2019. Today I’m reporting from Helsinki, Finaland where I am attending a Ministerial Conference on AI organised by the Finnish ministry of Economic Affairs. The conference brings together European ministers, business leaders and AI experts to discuss the future of AI in Europe. The AI Conference will be hosted by Finland’s Minister of Economic Affairs Mika Lintilä, Vice-President of the European Commission Jyrki Katainen and European Commissioner for Digital Economy and Society Mariya Gabriel. expertise at the EU level,” said Minister of Economic Affairs Mika Lintilä. Senior EU officials have expressed optimism that a Brexit deal can be struck by the end of the year. The president of the European Commission Jean-Claude Juncker said that the chances of the EU and the reaching an agreement have increased in the last few days and a deal could be agreed by November. Speaking to the Austrian press, Juncker talking about a possible Brexit deal, said, “We are not that far yet. But our will is unbroken to reach agreement with the British government.” He confirmed a deal could be agreed by November. “I have reason to think that the rapprochement potential between both sides has increased in recent days,” he added. Junker reiterated his position that a no-deal scenario “would not be good” for either the UK or the EU. The European Council President Tusk also expressed optimism that a deal could be reached before December. We will update this section during the week as stories develop. Ministerial Conference on Artificial Intelligence (Helsinki). European Parliament to discuss the state of play of Brexit in relation to Northern Ireland. European Parliament to discuss new regulation on the EU Cybersecurity Agency and Information and Communication Technology cybersecurity certification. European Parliament sub-committee on Security and Defence to discuss AI and its future impact on security. it-sa IT security exhibition 2018 (Nuremberg, 9-11 October). The ‘it-sa’ is one of the largest IT security exhibition in Europe with 630 exhibitors and over 10,000 attendees. Prof. Udo Helmbrecht, executive director of the European Union Agency for Network and Information Security (ENISA) is expected to be the main speaker at the “Innovative solutions to enhance cybersecurity in Europe” forum discussion. The workshop will also include sessions dedicated to medical devices as well as to emerging technologies in eHealth security like blockchain. The thirteenth Annual Meeting of the Internet Governance Forum (IGF) will be hosted by the Government of France at the headquarters of UNESCO in Paris from 12 to 14 November 2018. The IGF is a forum organised by the United Nations for multi-stakeholder dialogue on public policy issues related to key elements of Internet governance issues, such as the Internet’s sustainability, robustness, security, stability and development. Think Digital Identity for Government is for professionals involved in Identity across government and for department heads and policy and decision makers from within local and central government. The day will feature speakers discussing how their organisations are delivering and practising digital identity in public services, including the challenges, the success and the headaches. Among the speakers will be Cheryl Stevens, DWP Digital’s Deputy Director, Identity & Trust, and Think Digital will also be hearing from other serious exponents of identity in public services, in Whitehall and beyond.